I always have salmon on hand being that its one of my favorite fish. Another love of mine is pesto... even moreso now that I have a brand new 12 cup food processor to make a large batch effortlessly! Combining both salmon and pesto is a great flavor combination but instead of just tossing pesto with pasta and topping with salmon, I wanted something more. Thanks to Bridget, she had a dish I was looking for, which was also featured in other fellow blogs including Lisa's, Annie's and Erin's. 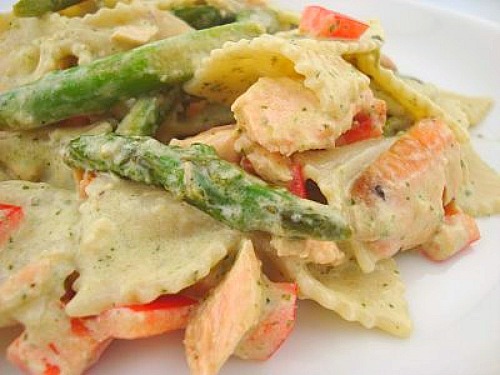 This Salmon Pesto Pasta captured all the flavors I love from the salmon and pesto, all binded with a creamy sauce. Bridget's recipe was adapted from the Pillsbury Complete Cookbook. I made further adaptations including broiling the salmon with lemon slices, using a basil and dill pesto with a hint of lemon zest and adding a diced mini sweet red bell pepper and asparagus. 1. Bring a large pot of water to a boil. When water is boiling, add 1 tablespoon salt and pasta; stir to separate pasta. Cook pasta until al dente; drain. Pour evaporated milk into empty pot and simmer over medium-high heat until reduced to ¼ cup. Add cooked pasta to pot and stir to combine. 2. Adjust oven rack to upper-middle position and heat broiler. Line a baking sheet or pan with aluminum foil. Place lemon slices on the lined baking sheet along with cut asparagus. Season one side of the salmon liberally with salt and pepper, sprinkle with zest, then rub with olive oil. Broil until salmon is no longer translucent and is firm when pressed, about 10 minutes. Remove from broiler and sprinkle with lemon juice. Use fork to flake into bite-sized pieces. Skin will stick to foil and can be discarded. 3. Add salmon and diced pepper to pasta mixture and stir over medium heat until hot. Remove from heat. Serve with freshly grated parmesan. I adore that recipe. I actually have it on my menu for next week! You are leaving me drooling over here :) Definitely a great, tasty meal in my future! This sounds fantastic - Mr. Foodie LOVES the salmon-dill combo, throw in some pasta and a cream sauce and he is beyond happy. I'll probably leave out the pepper as we both hate all things bell pepper, but I will be marking this to try next week! Yum! I love your changes - I need to make this again! I don't even like salmon but that looks delicious! I think I'm going to be brave and give it a try! I love salmon and made into a psta dish i am drooling ehre. I love creamy pasta sauces and I've never thought to use evaporated milk. This looks delicious! Joelen, this looks so yummy! Reminds me to use FF evaporated milk to thicken, rich-en up sauces! It's a good thing I like you so much or you could easily become my arch-nemesis, putting all the food I don't like in one dish. Not a bad idea for a new foodie super-villain. Looks so good and creamy. Go salmon. Oh, I bet the dill was awesome with the salmon. Good idea! yum! 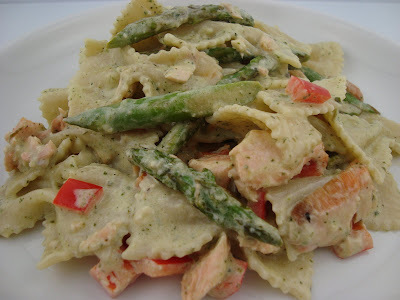 one of our favorite dishes is a salmon asparagus pasta. so good!